So I have, literally, been skating four times. I started about three weeks ago when my wife talked me into roller skating with her and the kids, and I caved in. After the first time, I was hooked. I lift weights, but I always find every excuse to avoid cardio, but I think I have found my alternative and now want to learn how to jam skate. In four days, I've learned how to go forward (lol), stop, turn around to skate backwards, crossovers and some jam moves. I've also learned how to fall and face plant-- sometimes with grace. My wife on the other hand, has been skating since she was a child, so she has no problems showing me up but a teacher she is not. What are some good online resources that can teach me linear levels of roller skating? I looked on youtube, and the videos and skill levels are a bit all over the place. I can look up moves and other techniques, but I am not sure what should come before the other. Can anyone help? I also had these built for me last week after buying GT50s and not liking all of the padding. I know. I'm a bit of a gear nut with everything I do. Riedell 265 with PD Rival, Bones Red and Bones Day of the Dead 92A. Oh, I also have some PD Jam Plugs in the front. Last edited by ringojcp; February 4th, 2015 at 02:58 PM. There are some beginner skate moves on YouTube. Since you only have been skating a short period, I would just keep going. The more you go the more comfortable you will become. If your crossing over in the turns easily, try to skate backwards. Plenty of videos on YouTube to skate backwards. Then go from forward skating to backward skating without stopping, and vise versa. Spin 360* one time. When you can do that, you can put a cool little jam skate together. Forward, backward, spin move, go forward again. These all take time to learn, but sounds like you are doing very well for just starting. Also things you might be able to practice at home. I like docskate rich Humphrey on YouTube. He has a old school style of dance on skates. I use some of his moves. Also look up 150 trick moves on skates. Pick out some easy cool ones, and practice them. Thanks! I've been looking at 150 on youtube, and I've been picking out tricks I'd like to learn. I'm learning how to grapevine on my toe wheels right now. I skate about twice a week and have made it a goal to learn at least one new thing every time, if not more. You're picking things up fast! I'm jealous. Do you practice somewhere at home or only at the rink? I'm finding I don't have enough space at home even though all my floors are hardwoods. Time to declutter! I'm practicing only at the rink. I have a stand up desk, so every now and then, I'll put my skates on and work at my desk. Since my first post, I'm able to heel toe, mohawk, turn on my toes and do a little bit of side surfing. I can do 3/4 of the grapevine, and the last 1/4 is failing because of my self trust. My wife hates me for how fast I'm learning the ropes, but I have a long way to go. What I've found to help me the most is going forward on one and two feet and finding my balance at different angles. Just a week ago, I still had problems going forward 100%, but it is smooth sailing now-- after a couple of drunk sessions that is. Also, confidence was a major factor when I first started. I'm 31, and the young kids were skating circles around me. I made some friends, and since then, I'm comfortable with copying what the kids and vets are doing rather than shriveling up like a raisin. I have hardwood floors as well, and my living room is about half the size of a rink without clutter. The only problem is that I do not have walls but very large glass, which I have ran into, so I've stopped home skating. Since you're learning as well, I'd love to hear tips and advice from your experiences. I started going with my kids (I'm 38 with 3 kids ages 13, 11, and 8) and fell in love with it. Now I'm looking for times to go to the rink. Just found out they have a morning adult/mix session with lesson/coaches. Might check that out. It's tomorrow, but I have to bring my kids and that's $10 a pop! So if I go the times I want to go and bring my kids, it's really gonna rack up! I do plan on practicing outdoors when there's not 40 inches of snow out there (I am not exaggerating. Just got through a blizzard that left 30 ish and then another storm yesterday that left a foot or so! I just figured out backward skating here in my living room lol. I have a natural turn out to my feet, which would be good if I were a ballerina. But it makes turning my feet in (or even straight!) difficult. It's really working my upper thigh/hip area though. So there's that. I can transition (mohawk) from front to back and back to front. Been trying the New York shuffle/downtown...there are so many names, but the crossovers are really tough with my previously mentioned turn out. im jealous of all you folks who seem to be catching on really quickly... i feel like im not progressing at all! but i think im gaining a little headway now that i have some real skates and not rentals. How do you feel like you're not progressing? I watch a lot of youtube videos which seem to help me a surprising amount. What I've found to help me progress the most is being unafraid to fail and fall. I set a goal for every night I go out to the rink, and I try to make them achievable. If I don't get all 2 or 3 moves down during the session, I look on my phone to find something easier to do. After tonight's roll, I can spin 360 on my heels, turn 180 on the front of my toes and do a really pathetic side surf....which inadvertently pushed me into doing the 360. I also started backwards crossover today as well. I think you should set small goals, starting with one new technique per session. I think that'll help you see success and motivate you to push harder. I broke my ankle last memorial day, and I was really afraid of hurting myself when I first put on the skates, so the first thing that I really learned was how to fall gracefully and not be embarrassed by it. My failure also motivates little kids to try hard-- seeing an adult fall multiple times. Sounds like your really getting the hang of it. The grape vine, I have seen done different ways, but they still call it the grape vine. Different styles, old school, new school. I have had knee surgery on both knees, so I can't get up on the front wheels, and do a lot of twisting. Watch the first 35 seconds of this video. This is rich Humphrey "dr skate" this is similar to what I do. I think it looks really cool. I just feel stuck on just getting going. I'm less scared of falling now that I have safety gear. But I also think there's lack of consistency. 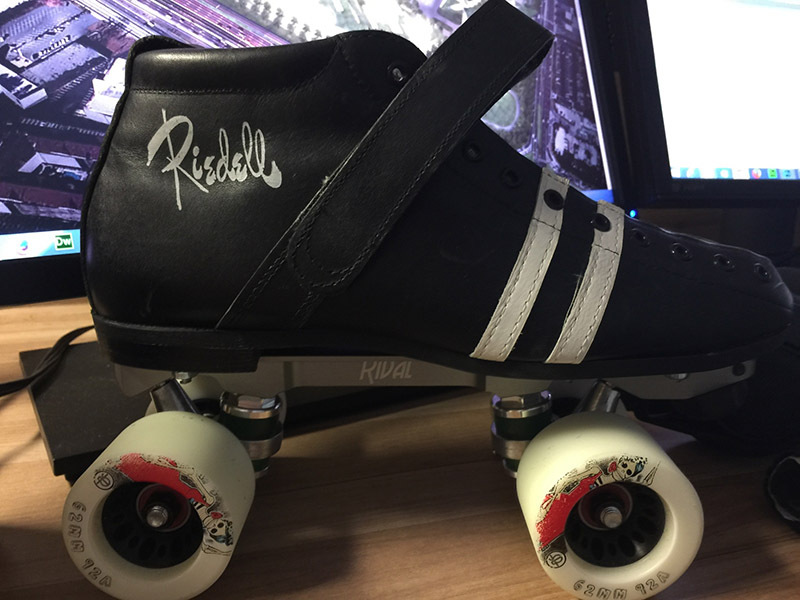 First it was the rentals then I got my skates, then I bought some indoor wheels so I keep changing any constant. I still can't stop. Haha but I did notice that are the harder wheels it was easier to attempt. I guess cause they don't grip/arnt as soft as before. At least your motivating the kids. Lol I'm work on things and on my free time I try to practice some moves off my skates to get my body used to the motions but I know nothing beats doing it on skates. But at the moment I can only get to the rink once a week and I haven't tried my outdoor wheels yet due to time constrictions and weather. Maybe soon. If I could do indoor and outdoor I'd have more hours to put into training. What I've found to help me progress the most is being unafraid to fail and fall. Skating is lots of fun(until you get injured). I haven't tried anything on a rink floor yet except crossovers. I AM afraid to fall lol I need to get over that. Also I haven't been wearing any pads. I have some cheap ones that I bought when I had a very short lived Healies phase. I still have them. Just haven't used them lately. I need to dig those pads up until I can invest in better ones. Better that than nothing, right? Since I just bought new skates for myself and all 3 kids and hubby is next after he heals from an injury, pricy pads gotta wait. I hope wearing them will help with the fear, but I doubt it. It's all mental. Maybe Sunday (hoping to make that my regular rink day) I can practice crossovers and backwards skate. Maybe some of the Downtown move. (the first move in that teaching video above) Thing is, I'm not ready to skate backwards in a circle yet and if it's crowded it might be hard/against the rules to find a space to just practice that. There is NO ONE doing dance in the middle here...sad. I also wish the dj would announce a reverse skate every once in a while so I can get my right turns on. No idea how I am with that. Maybe I'll suggest it one week. Get out in the middle, that is what it is for. Dance moves, backwards, spins etc. I'm teaching my boys how to skate backward now. Remember if you get into trouble skating backwards, you can always lean forward, and get on the toe stops. Maybe I'll get over it on Sunday. That's how I felt the first few days. Now, I just want to push the little kids to the floor so that they can be out of my way!